First introduced for the 2008 model year, the Nissan Rogue has become a key player in the highly competitive compact SUV market - addressing both the functional and emotional needs of buyers while offering great value. Now, with a complete redesign for the 2014 model year, Rogue challenges convention once again with bold emotive styling, a premium interior created with comfort and multi-tasking in mind, and an array of available affordable techonologies. For the first time Rogue offers optional 3-row/7-passenger seating, thanks to its improved interior packaging efficiency. Among the many interior highlights are the exceptional passenger and cargo flexibility with its innovative EZ Flex seating System. The new Rogue also offers an innovative, class-exclusive* Divide-N-Hide Cargo System that provides 18 adjustable variations (two-row models) between the cargo and occupant areas - including out-of-sight storage and a lower deck to handle taller items. Altima, Pathfinder, Sentra and Versa Note before it, we're bringing a new level of affordable technologies and innovations to a segment looking for fresh ideas." Now assembled in Smyrna, Tennessee, the 2014 Nissan Rogue is the first vehicle to utilize the new jointly developed Nissan/Renault Common Module Family (CMF) platform architecture. The added efficiencies provided by the joint development allow Nissan to deliver unprecedented value in the segment. Rogue is one of a family of new Nissan global compact crossovers, along with the European version, called the Nissan X-TRAIL. As high-volume global growth products, Rogue and X-TRAIL are projected to be available in 190 countries around the world. The 2014 Rogue&apos;s completely redesigned exterior provides a premium, high-quality look and feel with no compromise of the functional aspects that are so important to owners in this class. Rogue offers a compact overall size and ample interior roominess, thanks to its long wheelbase and short front and rear overhangs. Versus the previous generation Rogue, the wheelbase has been increased by 0.6 inch, the overall height increased by 1.2 inches and the front overhang reduced by 1.5 inches. In addition, the rear doors have been designed with a wider opening (77 degrees) for easier entry and exit to the rear passenger space. Rogue&apos;s bold, sharp bodylines offer a sporty and confident appearance, balancing its sleek style with an aggressive stance provided by large wheelwells and available 18-inch wheels and tires. The coefficient of drag has been reduced by about 10 percent from the previous generation to 0.33 by optimizing the A-pillar section and outside mirror shapes, which also helps reduce wind noise. The turbulence behind the body has been reduced through optimization of the rear roof spoiler, rear side spoiler and rear combination lights. Underbody aerodynamic devices include a Nissan-first muffler spoiler, along with a rear bumper closing panel, fuel tank deflector, rear suspension cover, engine under cover and front tire deflectors. Exterior highlights include standard halogen headlights with signature LED daytime running lights making a powerful visual statement. Also featured are body-color outside mirrors with standard integrated turn signals and a rear spoiler. Also available are LED headlights with auto levelizer, fog lights, privacy glass, roof rails, heated outside mirrors and power liftgate. Rogue&apos;s available power panoramic moonroof offers a panoramic view through its extended length. The front glass panel slides and tilts, while the rear glass panel is fixed. When in the open position, the front panel slides under the fixed second panel. Rogue is offered in eight exterior colors: Midnight Jade, Saharan Sun, Brilliant Silver, Gun Metallic, Super Black, Cayenne Red, Moonlight White and Graphite Blue. "Rogue&apos;s bold, dynamic new styling is going to generate tremendous attention," said Pierre Loing, Vice President, Product and Advanced Planning and Strategy, Nissan Americas. "And once buyers take a look inside at the roomy, premium interior and experience the long list of affordable user-friendly technologies, we think they'll be delighted." Rogue&apos;s comfortable, inviting interior offers a definite "wow" factor for occupants - unexpected roominess along with a marriage of refined styling and premium comfort. Among the factors that have improved roominess (versus the previous generation Rogue) are the optimized front headrest shape, lowered front seat shoulder height, forward-shifted center console location, reduced front seatback surfaces, reduced rear door speaker enclosure intrusion, lowered door trim height and the new sliding/reclining 2nd row seat design. As a result, Rogue features ample interior roominess and 70.0 cubic feet of cargo room (rear seats folded down). The new Rogue&apos;s front bucket seats are a special "zero gravity"-inspired design. Similar to the Nissan Altima&apos;s front seats, the articulated seat shape provides continuous support from the pelvis to the chest, helping reduce fatigue over long periods behind the wheel. The available Quick Comfort heated front seats are designed to immediately begin warming the body parts that are most sensitive to heat, such as the thighs and hips. Then, to maintain a warm, cozy feeling, the heater increases heating on body pressure points. The driver&apos;s seat is 6-way adjustable, with available power adjustment incuding lumbar support, while the front passenger seat is 4-way adjustable. With Rogue&apos;s innovative EZ Flex Seating System, every seat except the driver&apos;s easily folds down. The front passenger seat folds rearwards, allowing transport of long items such as an 8-foot ladder when combined with the flat folding 40/20/40-split 2nd row seat. The optional stadium-style, flat-fold 3rd row 50/50-split bench seat enhances Rogue&apos;s outstanding passenger versatility. Rogue offers 37.9 inches of 2nd row legroom with its 9.0 inches of fore/aft adjustability. The new Rogue interior design also offers a range of smart storage and convenience solutions, with six front storage areas (five within the driver&apos;s reach), two front cupholders and two front bottle holders. Other standard interior features include Fine Vision electroluminescent gauges, front center console, power windows with driver&apos;s auto up/down, 5.0-inch center meter color display (Advanced Driver Assist Display), air conditioning with microfilter and class-exclusive* adjustable 2nd row vents, 4-speaker AM/FM/CD audio system with auxiliary audio input jack, power door locks with auto-locking feature, LED maplights, USB connection port for iPod interface and other compatible devices, Bluetooth Hands-free Phone System, RearView Monitor, Streaming Audio via Bluetooth and Hands-free Text Messaging Assistant. Also available are dual-zone automatic air conditioning, leather-appointed seats, Bose audio system with nine speakers. Two interior colors are offered: Charcoal and Almond. Available Rogue connected technology and smartphone integration includes the advanced NissanConnectTM with Navigation system with 7.0-inch color touch-screen display, Nissan Voice Recognition for navigation and audio, NavTraffic and NavWeather, SiriusXM Travel Link (SiriusXM subscription required, sold separately), and NissanConnectTM Apps. "Rogue&apos;s smartphone integration system allows drivers to seamlessly connect their digital life to their in-vehicle experience. With the Hands-free Text Messaging Assistant they can receive incoming messages from smartphones, and with Streaming Audio via Bluetooth anyone can DJ from anywhere in the Rogue," added Loing. Rogue&apos;s available class-exclusive* Around View Monitor (AVM) with Moving Object Detection (MOD) system utilizes four small superwide-angle cameras mounted on the front, side and rear of the vehicle to provide a "bird&apos;s eye" virtual 360� view of objects around the vehicle. It provides additional selectable split-screen close-ups of the front, rear and curb views, helping the driver maneuver the car in or out of tight spots. Moving Object Detection builds on the capabilities of the AVM system, helping enhance the driver&apos;s situational awareness by providing visual and audible warnings (front, side or back range object detection) if the system detects moving objects (such as another vehicle) within the displayed image in situations such as when pulling out of a parking space. Using sophisticated image processing technology, the system detects moving objects within the "top view" (when the vehicle is in Park). When starting off or backing up, it detects moving objects crossing within the front or rear views. Other Rogue Safety Shield technologies include Blind Spot Warning (BSW), Lane Departure Warning (LDW) and Forward Collision Warning (FCW). 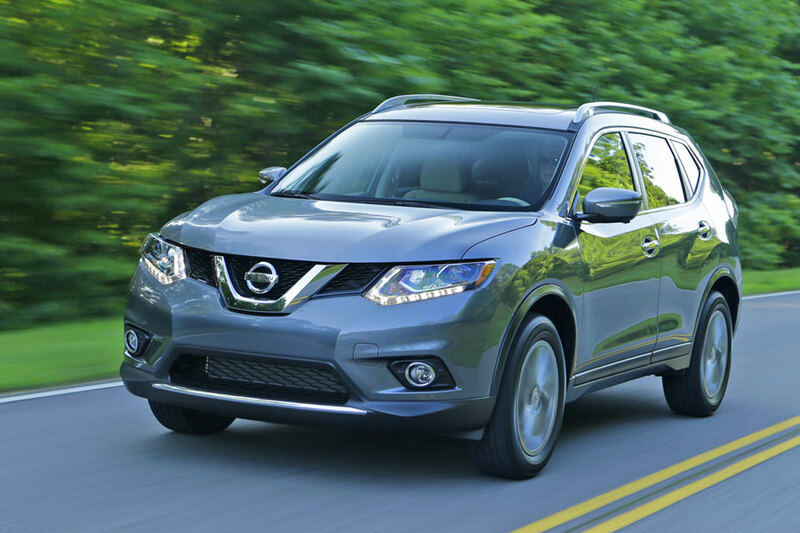 Every 2014 Nissan Rogue is equipped with a responsive 2.5-liter 4-cylinder engine rated at 170 horsepower and best-in-class* 175 lb-ft of torque. The engine is matched with an advanced next-generation Xtronic CVT (Continuously Variable Transmission) with standard Sport Mode switch. With a 40 percent reduction (versus previous generation) in friction loss, along with an improved belt and pulley system, reduced oil churning friction, compact oil pump, new electronic control, wider gear ratio and other enhancements, the new CVT is approximately 10 percent more efficient than the previous-generation CVT. Fuel economy is rated at a best-in-class* 33 mpg highway for front-wheel drive CVT-equipped models - representing an 18 percent improvement in highway fuel economy versus the 2013 model. Rogue city fuel economy is rated at 26 mpg, while combined fuel economy is 28 mpg (front-wheel drive models). Rogue AWD models are rated at 25 mpg city, 32 mpg highway and 28 mpg combined. The new Rogue carries the distinctive "PURE DRIVE" badge, reflecting Nissan&apos;s commitment to developing more environmentally friendly transportation for every market. The new Rogue also features Nissan&apos;s new suite of confidence-inspiring dynamic technologies with Active Trace Control, Active Engine Braking and Active Ride Control. The Active Trace Control system utilizes Rogue&apos;s standard Vehicle Dynamic Control (VDC) system to help improve cornering feel by automatically applying the brakes or smoothing engine torque characteristics while accelerating. With Active Engine Braking, the CVT helps slow the Rogue as the driver brakes, resulting in less brake effort by the driver. Active Ride Control helps smooth out the drive by automatically applying the brakes and adjusting engine torque after the vehicle hits a bump, reducing the typical "head bobble" pitch. The 2014 Rogue also offers standard 4-wheel independent suspension, Electric Power-assisted Steering, 4-wheel disc brakes with Anti-lock Braking System and Vehicle Dynamic Control (VDC) with Traction Control System (TCS) and Hill Start Assist. Rogue is available with a choice of front-wheel drive or an intuitive All-Wheel Drive system with standard Hill Descent Control. Rogue S models are equipped with 17-inch wheels and 225/65R17 all-season tires, while 17-inch aluminum-alloy wheels are standard on Rogue SV. Also available are 18-inch aluminum-alloy wheels with 225/60R18 all-season tires on Rogue SL models. Safety and security features include the Nissan Advanced Air Bag System (AABS) with dual-stage supplemental front air bags with seat belt and occupant classification sensors; front seat-mounted side impact supplemental air bags; roof-mounted curtain side impact supplemental air bags with rollover sensor for front and rear-seat outboard occupant head protection; 3-point front and rear seatbelts, front seat belts with pre-tensioners and load limiters and adjustable upper anchors; and LATCH System (Lower Anchors and Tethers for CHildren). Every Rogue also offers child safety rear door locks; Zone Body construction featuring front and rear crumple zones and occupant zone; Nissan Immobilizer system and anti-theft alarm system; and Tire Pressure Monitoring System (TPMS) with position monitoring and Nissan&apos;s innovative, class-exclusive* Easy Fill Tire Alert. The 2014 Nissan Rogue comes in three well-equipped models, S, SV and SL, each in a choice of front-wheel or all-wheel drive. Along with the long list of standard features found on Rogue S, the Rogue SV adds 17-inch aluminum-alloy wheels, dual-zone automatic climate control, privacy glass, Nissan Intelligent Key with Push Button Ignition, 6-way power driver&apos;s seat, power driver&apos;s seat lumbar support, SiriusXM Satellite Radio (SiriusXM subscription required, sold separately), NissanConnectTM Apps, two additional audio system speakers, roof rails and Smart Auto on/off headlights. Rogue SL models include leather-appointed seating, Bose audio system with nine speakers, NissanConnectTM with Navigation, 7.0-inch QVGA color touchscreen display, power liftgate, Around View Monitor, 18-inch aluminum-alloy wheels, fog lights, Quick Comfort heated front seats and outside mirrors and leather-wrapped steering wheel and shift knob. Available option packages include the Family Package (S, SV) with 3rd row seating, privacy glass (S only) and run flat tires; the Moonroof Package (SV) with power panoramic moonroof; the Premium Package (SV) with NissanConnectTM with Navigation, Around View Monitor, Blind Spot Warning, Lane Departure Warning, Moving Object Detection and power liftgate; and the Premium Package (SL) with power panoramic moonroof, LED headlights with auto levelizer, Blind Spot Warning, Lane Departure Warning, Moving Object Detection and Forward Collision Warning. The 2014 Nissan Rogue will be assembled in Smyrna, Tennessee. *AutoPacific Segmentation. 2014 Rogue v. '13 and '14 competitors, Midsize Compact Class. **Targeted 2014 Rogue EPA Fuel Economy Estimate of 33 MPG. Nissan Testing results not yet EPA confirmed.